OSCAR MORENO MANOSALVA IDENTIFICADO CON EL PASAPORTE No. 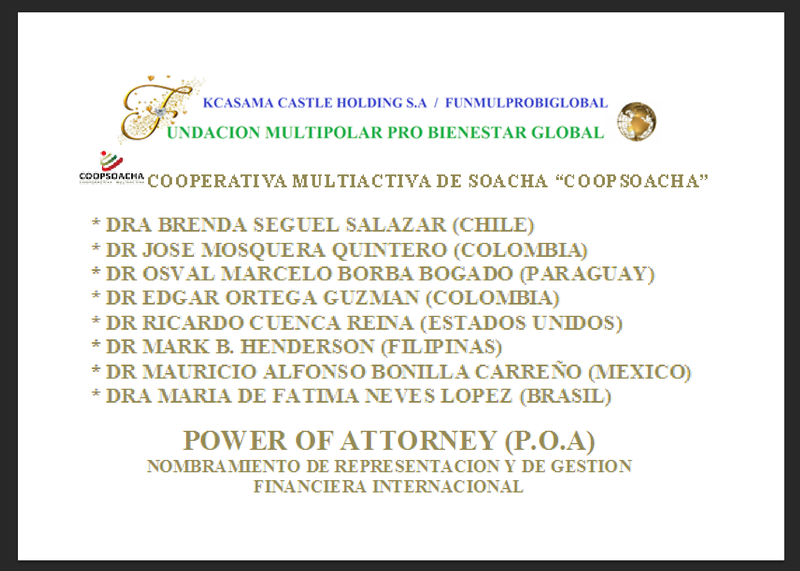 AQ751574 ACTUANDO COMO PERSONA NATURAL Y TAMBIEN EN SU CALIDAD DE REPRESENTANTE LEGAL DE LA COOPERATIVA MULTIACTIVA DE SOACHA "COOPSOACHA", DEBIDAMENTE INSCRITA EN LA CAMARA DE COMERCIO DE BOGOTA EL DIA 27 DE AGOSTO DE 1997 BAJO EL NUMERO S0005753, CON PERSONERIA JURIDICA NUMERO 2269 DEL 27 DE OCTUBRE DE 1988, IDENTIFICADA CON EL NIT. NUMERO 800059993-5, EN SU CALIDAD DE DIRECTOR DEL PROGRAMA DE LA “PLATAFORMA DE AYUDA HUMANITARIA OMM DE COOPSOACHA”, CON SU PROGRAMA BANDERA: “CONTROL, ERRADICACION Y EXTINCION DEL HAMBRE Y DESNUTRICION EXTREMA MUNDIAL”, EN CONVENIO DE ASOCIACION CON EL DR EGLAIN VILLANUEVA TAVERAS IDENTIFICADO CON EL PASAPORTE No. 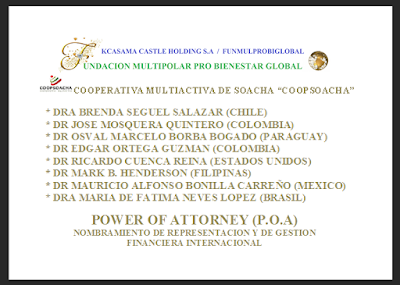 SC8081270, DE REPUBLICA DOMINICANA, ACTUANDO COMO EL REPRESENTANTE LEGAL Y TAMBIEN PRESIDENTE DE LA FUNDACION MULTIPOLAR PRO BIENESTAR GLOBAL “FUNMULPROBIGLOBAL” DEBIDAMENTE INSCRITA EN LA CAMARA DE COMERCIO DE VILLAVICENCIO EL DIA 22 DE ENEROS DE 2010 BAJO EL NUMERO 00018963 DEL LIBRO 1, CON PERSONERIA JURIDICA SIN ANIMOS DE LUCRO 22 DE ENEROS DE 2010, IDENTIFICADA CON EL NIT. NUMERO 900335344-1, Y TAMBIEN REPRESENTANTE LEGAL DE KCASAMA CASTLE HOLDINGS LIMITED, INCORPORATION N° 1312737 UNDER THE LAWS OF HONG KONG, REGISTERED OFFICE FULL ADRESS Unit1001, 10/F., Fourseas Bldg 208-212 Nathan Rd., Jordan Hong Kong. 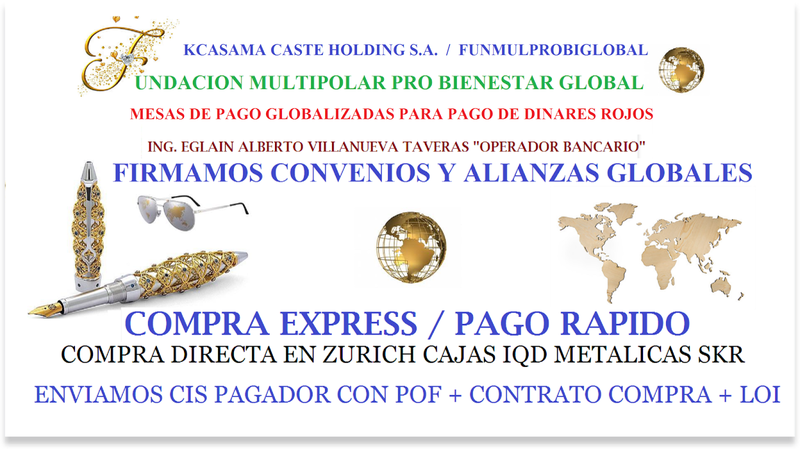 · *SE MANIFIESTAN LA VOLUNTAD DE NOMBRAR COMO EMISARIOS GLOBALES DE GESTION INTEGRAL Y REPRESENTACION DE CARÁCTER FINANCIERO, COMERCIAL, FILANTROPICO Y DE FRONTING FACULTADOS Y AUTORIZADOS, SIN NINGUN TIPO DE LIMITACION PARA LA LIBRE OFERTA Y LIBRE DEMANDA DE COMODITIES, BONOS Y DINARES DE NUESTRA PLATAFORMA MULTIPOLAR DE LA COOPERATIVA MULTIACTIVA DE SOACHA “COOPSOACHA”, ASI COMO TAMBIEN LA REPRESENTACION DE LA FUNDACION MULTIPOLAR PRO BIENESTAR GLOBAL “FUNMULPROBIGLOBAL” Y DE KCASAMA CASTLE HOLDING LIMITED.